Living on Haida Gwaii, my practice encompasses working with natural materials it is a life long experience tied to Nature's time, and the many forms it takes and how we interface with it. Everything around us including ourselves is derived from nature. The focus of my new work is working with impossible shapes such as moss balls. While working on an outdoor project to raise awareness about the destiny of a popular walking trial, I started experimenting and weaving large balls of moss held in place with twigs in vrious sizes. I brought materials into my studio as I worked I randomly placed the pieces as if they rolled from some giant hand. 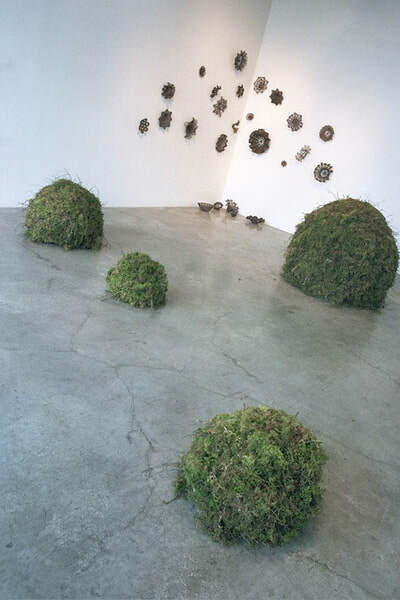 Simple elements from nature in an artificial setting where they look out of place provides a tension that reminds me of man's discomfort the resonance between art and the environment by circumventing the usual practice of installation in a natural setting. 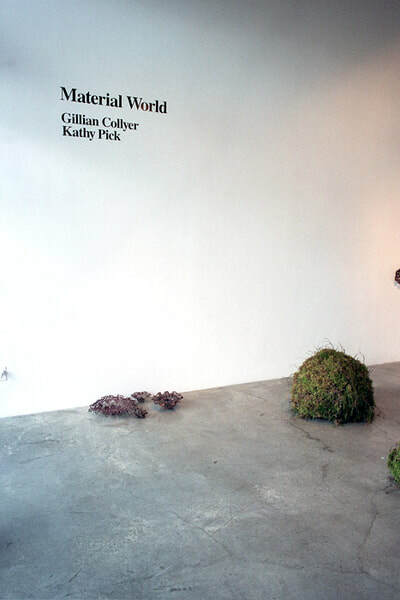 Shown in a gallery Moss Balls made of natural material in unnatural shapes inspires the viewer to a state of awareness in which the natural materials have no logic or rational purpose. 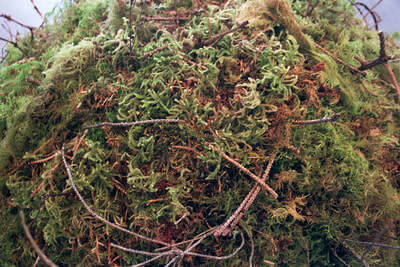 My intention in creating this impossible landscape is to transform our preception of natural materials and space. Moss is a tranquil, resting, thinking material blanketing the earth, it embodies, a silence , a time for quiet contemplation, moss balls inspires visio ns of landscapes. Landscape in science fiction, and a stat of spiritual awareness in its minimalism. The belief and value system of modern day consumer society and mass- media immagery suggests less time for using imagination or direct interaction with nature. The intent of my work with its simplier imagery uncluttered by any particular pleadings allows the opportunity for the viewer to bring their thoughts and interpretations into play.